Sinn Féin spokesperson for Employment Affairs & Social Protection John Brady TD has expressed frustration at the fact that thousands of pensioners, who have been wrongly receiving reduced State Pensions since 2012, will not see that lost money returned to them. Cabinet Ministers met today to create a plan to reverse the changes, which were introduced by the Labour Party’s Joan Burton and reduced the pensions of over 42,000 people. A vast majority of those affected were women who left work for a number of years to raise families, with some losing out on nearly €30 a week. This was due to the fact that the Government made it more difficult for people with irregular Social Insurance contributions to get a decent pension when they changed the criteria in 2012. Today’s meeting concluded that those affected will have their entitlements reassessed later this year. If they do qualify for a higher rate, this will only be backdated until March 30th 2018. Furthermore, the money will not be paid until the first quarter of 2019, due to the fact that the Government does not currently have the funding for the pension increases. Sinn Féin spokesperson John Brady TD has said that the solution brought forward today by the Social Protection Minister, Regina Doherty, has failed to meet the mark in terms of resolving the matter. Teachta Brady said: “Pensioners were very clear when they protested outside Leinster House last week that they wanted to see the reversal of the 2012 changes, and they wanted the money they have wrongfully lost given back to them. 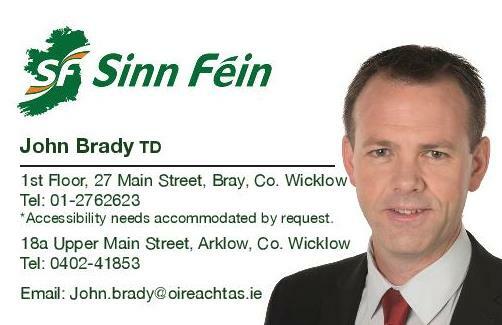 The Sinn Fein TD for Wicklow welcomed the review of pensioner’s entitlements, as well as the introduction of a new Home Caring Credit of up to 20 years. This change will assist workers who took time out to raise families, but Brady added that more must be done to completely resolve the matter. Teachta Brady continued: “As a means to address the impact that the 2012 changes have had on over 42,000 people, the Government is bringing forward the Total Contributions Approach for these people.